Recorded in many spelling forms including Ansell, Anselm, Hancel, Haensel, Hansel, Hensel and Henschel, this ancient surname is of pre 7th century Old German origins. It derives from a personal name composed of the elements "ans" meaning god, and "helm", a protector or helmet. Outside Germany itself the surname was particularly associated with Lombardy, a northern region of Italy, but originally a state, which fell under German influence. 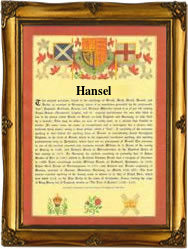 The name was also introduced into the British Isles by St. Anselm (1033 - 1109), the Archbishop of Canterbury. He was a Lombard by birth, and although the name never became as popular with the English. In Germany early examples of the surname recording include those of Heinrich Hansel in the charters of the city of Hanover in the year 1272, whilst in England early recordings include William Hansell in the Friary Rolls of the county of Yorkshire in the year 1495, and the marriage of Thomas Ansell and Gwynne Jones. This was recorded at St. Giles' Cripplegate, in the city of London, on May 16th 1588. The first recorded spelling of the family name anywhere in the world is probably that of Petrus Anselmus, which was dated 1192, in the "Pipe Rolls of Sussex". This was during the reign of the famous King Richard the Lionheart, 1189 - 1199. Surnames became necessary when governments introduced personal taxation. In England this was sometimes known as the Poll Tax. Throughout the centuries, surnames in every country have continued to "develop" often leading to astonishing variants of the original spelling.